A first-time high-yield debt offering to help the EV, storage and solar company hit growth goals. Tesla is turning to the junk bond market to help meet its hefty expansion goals. On Monday, the company announced that it’s planning to raise $1.5 billion in its first-ever debt offering to fund production of the Model 3 EV sedan and its Nevada battery Gigafactory. Tesla’s $1.5 billion offering of unsecured senior notes, due in 2025, marks the first time the EV-battery-solar maker has turned to traditional debt markets to fuel its rapid expansion. Previously the company raised money through equity and convertible debt, most recently in a $1.15 billion raise in March, including $250 million of common stock and $750 million of convertible senior notes due in 2022. Tesla has raised nearly $4.5 billion in stock sales, including its 2010 initial public offering, and had total recourse debt of $5.6 billion and non-recourse debt of $2.5 billion, according to its latest quarterly filing with the Securities and Exchange Commission. 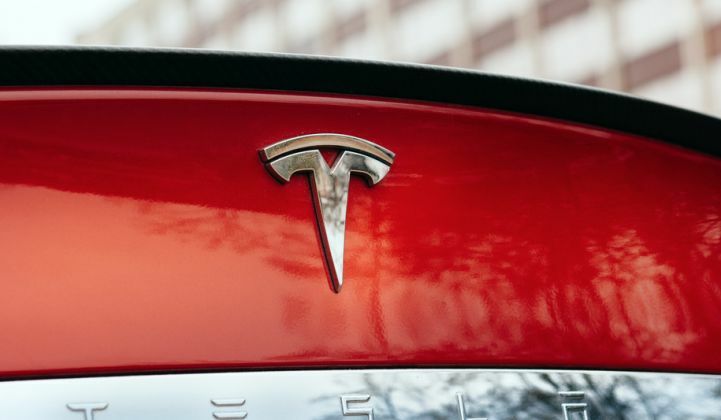 Tesla’s market cap surpassed giant automakers like Ford and General Motors earlier this year, despite its relatively tiny share of the auto market. But this valuation is based on expectations rather than current financials. Tesla continues to lose money every quarter -- $401.43 million on revenues of $2.79 billion in the second quarter of 2017, compared to a $293 million loss on revenues of $1.27 billion in the same quarter last year. The company needs a lot of money to meet manufacturing goals. Tesla expects capital expenditures this year to reach $2 billion in order to gear up production of the Model 3, as well as to build out the Gigafactory for EV batteries and stationary storage units. Tesla plans to scale up Model 3 production from zero to 20,000 cars a month by December, and 50,000 a month by the close of 2018. It’s competing against lower-cost EVs from giant automakers, like General Motors’ Chevy Bolt and BMW’s i3. Monday’s debt offering comes a week after Tesla’s second-quarter 2017 earnings report, in which CEO Elon Musk announced the first deployments of the long-awaited Solar Roof tiles on employee homes. Tesla’s solar business is built on SolarCity, the country’s leading rooftop solar provider, which Tesla acquired for $2.6 billion last year. Meanwhile, Tesla’s energy generation (i.e., solar) and grid energy storage business generated just $286.78 million of its $2.79 billion in second-quarter 2017 revenues, indicating the relatively small scale of those business lines compared to its EVs.